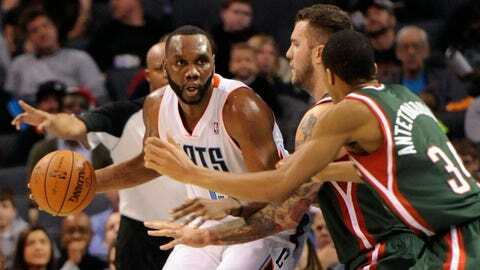 Bobcats center Al Jefferson prepares to pass the ball as he is defended by Milwaukee Bucks center Miroslav Raduljica and forward Giannis Antetokounmpo (34) during the first half of the game Monday at Time Warner Cable Arena. CHARLOTTE, N.C. — Kemba Walker said the most notable transformation between this year’s Charlotte Bobcats and teams of the past is now they expect to win games. "That’s what it is," Walker said. "We go into games knowing that we have a chance. We have the players and we have the character. That’s the difference." The Bobcats went 28-120 in their previous two seasons, but a renewed sense of confidence and determination is paying off. Well, that and a having a big man who can dominate in the low post. 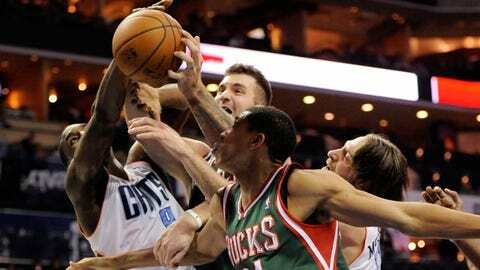 Center Al Jefferson had a season-high 26 points, Walker nearly had a triple double and the Bobcats overcame an 18-point deficit to escape with a 111-110 overtime win over the Milwaukee Bucks for their fourth victory in the past five games Monday night. Walker had 25 points, 10 assists and nine rebounds, and Anthony Tolliver had 12 points on four 3-pointers as the Bobcats avenged a hard-to-swallow loss at home Saturday night against the Utah Jazz. Rookie Cody Zeller added a career-high 12 points for the Bobcats (14-15) in what coach Steve Clifford called his best NBA game. Jefferson told Walker this summer that he was signing as a free agent with the Bobcats because he expected to win games. He didn’t want to play for a cellar dweller. "I told him I’m not going to get used to losing," Jefferson said. "We want to try to turn things around. So far, so good." It’s the third time in the last four games the Bobcats have come back from at least 16 points down to win. "We don’t like getting down that early, but it happens," Walker said. "We are showing our resiliency. We are showing that when we get down, we’re not out. We’re going to keep fighting. The game is never over, especially in this league." Brandon Knight had 26 points and 14 assists to lead the Bucks (6-22), who have lost five of their last six games. The Bucks had a chance to tie in overtime off an inbounds play with 1.6 seconds left, but officials ruled Khris Middleton’s foot was on the line and his jumper counted as two points instead of three. "I didn’t know where I was," said Middleton, who had 19 points. "It was a good play and a good shot, but obviously my foot was on the line. Anybody wants that situation. I just caught it and shot it." It was Charlotte’s third victory this season against Milwaukee, although this one was much closer than the previous two. The Bobcats beat the Bucks twice in November by 24 and 16 points. But it was Milwaukee that jumped out to a 35-17 lead in the second quarter by dominating the boards. Charlotte’s starters were 6 of 20 from the field at one point before Jefferson started to get hot toward the end of the second quarter and helped the Bobcats trim the lead to 54-52 at the break. The teams entered the fourth quarter tied, but Tolliver knocked down his fourth 3-pointer with 4:02 left on the clock to give Charlotte a 96-94 lead. The Bucks would cut the lead to one with 35 seconds left before Walker hit a pull-up jumper from 13 feet with 16 seconds left. After a timeout, Middleton missed a 3-pointer, but O.J. Mayo grabbed the loose rebound and knocked down a 25-footer to send the game into overtime. In the extra period, the Bobcats took a one-point lead late on a free throw by Jefferson. The Bucks had a chance to take the lead but Middleton missed a jumper and Walker grabbed his ninth rebound of the game. Walker knocked down two free throws with 1.6 seconds left to push the lead to 111-108. Milwaukee’s last ditch effort fell short when Middleton’s jumper at the buzzer from the right corner went in, but was ruled a two-pointer. Replays showed his foot was on the line. "We just have to get over the hump," Bucks coach Larry Drew said. "We’re knocking at the door. We just have to get over the hump. We’re putting ourselves in position. Like I told the guys, we can have good stretches and then we have breakdowns. Bad shots are just as good as a turnover. Particularly on the road. You have to be disciplined enough to get good shots." The Bobcats had a season-high 10 3-pointers including a 4-for-4 effort by Tolliver, who took over as the starter after Jeffery Taylor tore his Achilles tendon last week. NOTES: The Bobcats announced that Taylor had surgery to repair a torn right Achilles tendon and is expected to miss six to nine months. … Jefferson has scored in double digits in 16 straight games for the Bobcats. … Former North Carolina Tar Heel P.J. Hairston was on hand for the game against the Bucks watching former college teammate John Henson.